The Uffizi Gallery (Galleria degli Uffizi in Italian) is the most famous museum in Florence, and one of the most famous and important museums in the world. In 2018 – with 2.235.328 visitors – was the most visited museum in Italy. The building that houses the Galleria degli Uffizi dates back to 1560. It was built by Giorgio Vasari for Cosimo I de’ Medici, to house the administrative and legal offices (uffizi in ancient Italian) of Florence. Giorgio Vasari completed it a few years later with the addition of a corridor (the famous Corridoio Vasariano or Vasari Corridor) connecting it with the Pitti Palace, new residence of the Medici family. In 1574 the works, not yet completed, was entrusted by Francesco I de’ Medici, son of Cosimo I, to Buontalenti. In 1580 the work was completed and the following year Francesco I decided to use the rooftop loggia as personal gallery. He placed there his collection of paintings from the fifteenth century, as well as cameos, stones, jewelery, statues, bronzes, miniatures, scientific instruments, and natural rarities. Since then, the Uffizi building was enlarged according to its new function. Always on a project by Buontalenti, were built the theater and the tribune. Between the sixteenth and seventeenth century were built the Hall of Geographic Maps, dedicated to maps of the Medici domains in Florence, Siena and island of Elba, and the Mathematics Room which featured scientific instruments very innovative for the period. In 1588 the Uffizi Gallery was enriched with the presence of the Opificio delle Pietre Dure, a world famous workshop still existing that provide stunning semi-precious stones mosaics. Vittoria della Rovere, wife of Grand Duke Francesco III and the last descendant of the Dukes of Urbino, then enriched the Uffizi Gallery of beautiful works of art by Titian, Piero della Francesca, Raphael, Federico Barocci and others. Cosimo III then proceeded with other acquisitions, such as the beautiful Flemish paintings (for instance by Rubens) and the Medici Venus (Venere Medici), a rare original Greek sculpture. In the Sala della Fonderia were collected instead objects that aroused the curiosity of both the Medici family and the intellectuals of the Renaissance, such as mummies and stuffed animals. With the end of the Medici dynasty, the Uffizi Gallery maintained its integrity thanks to the legacy of the last heir. Anna Maria Luisa de’ Medici left everything to the Lorraine family, but asked that the whole collection remained intact and were preserved in Florence. The House of Lorraine opened the gallery to the public in 1769 and reorganized the collections according to the criteria of the Enlightenment, that is separating the works of the major arts from those of the minor arts. The collections of weapons, majolica and scientific instruments were then moved. Since then, the Lorraine family decided to collect mainly works at European level, such as paintings by Titian, Giorgione, and Dürer. During the nineteenth century the Uffizi Gallery was enriched with sculptures of famous people – some of these made by Giovanni Dupré – which were placed in the niches under the Uffizi portico. In the twentieth century the Uffizi were characterized more as a gallery of paintings: many of the sculptures were moved to other museums in Florence, and many paintings belonged to collections of churches and religious institutions were acquired. Today, the Uffizi Museum is being expanded, to allow visitors to admire the many precious art works preserved in the storage of the building. The Uffizi Tribune Room is the oldest room of the museum, and became a romantic symbol made famous by the European fashion of the grand tour. The room is richly decorated with enamels and shells according to the theme of the four elements (Earth, Air, Water, Fire), typical of the scientific curiosity of the Renaissance. In the Tribuna degli Uffizi you can still breathe the original spirit of the Galleria degli Uffizi, designed to arouse wonder with its works of art. The Uffizi Gallery Museum is divided into rooms dedicated to different artistic periods. The Middle Age Halls feature the three Virgin in Majesty by Cimabue, Giotto and Buoninsegna, and compostions by Sienese and Florentine schools, including the Adoration of the Magi (Adorazione dei Magi) by Gentile da Fabriano. The Renaissance Halls feature paintings of Masolino, Masaccio, Paolo Uccello, Fra Angelico, Filippo Lippi and Piero della Francesca (including the famous Portraits of the Duke and Duchess of Urbino). 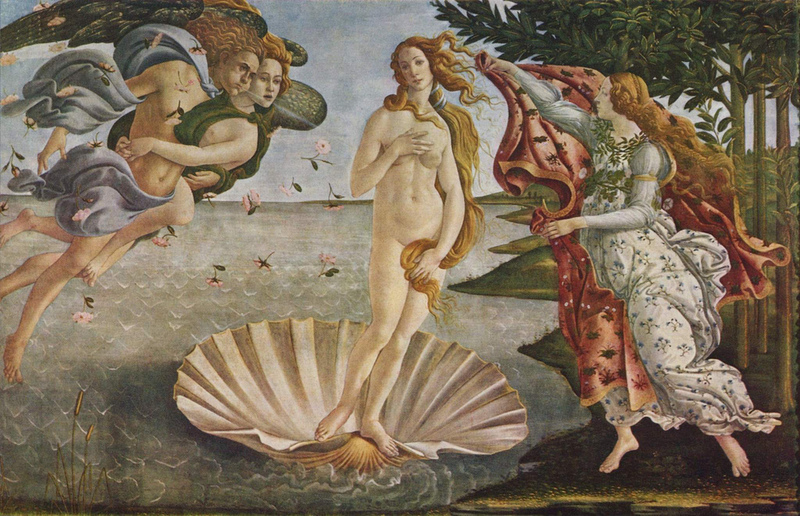 The Hall of Botticelli is particularly impressive, as it houses two of the most famous paintings in the world: the Allegory of Spring (Allegoria della Primavera) and the Birth of Venus (Nascita di Venere). 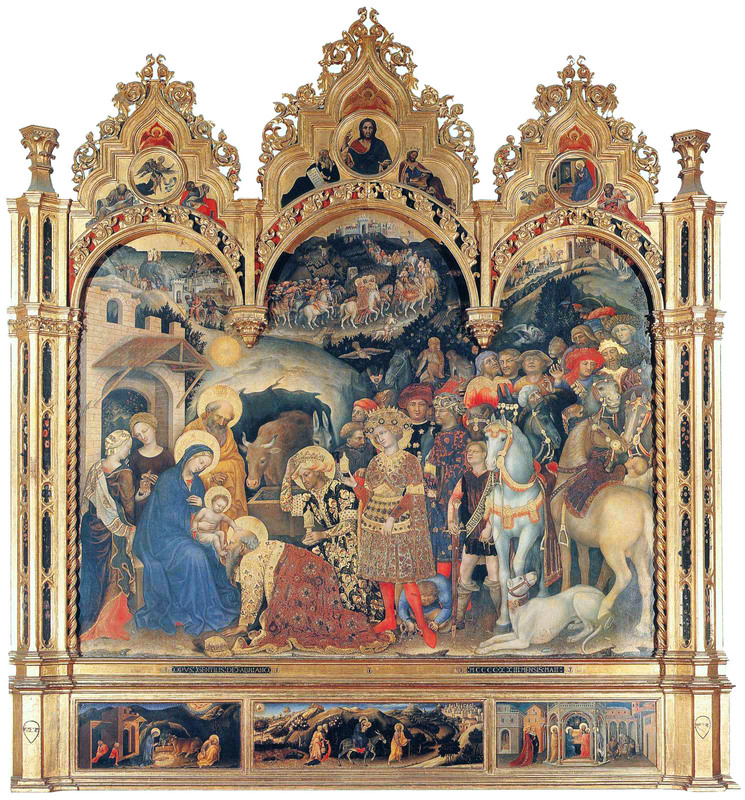 These paintings were made in the eighties of the fifteenth century and are the first example in Italy of a secular subject in a painting of such a large size. In this room is witnessed throughout the artistic evolution of Sandro Botticelli, from early works such as the Madonna of the Rosegarden to the more mature works such as the Madonna of the Pomegranate. In this room there are also some Flemish masterpieces, which witness the vibrancy and cultural openness in Renaissance Florence. Another room is dedicated to Leonardo da Vinci and houses his Annunciation and his Adoration of the Magi, along with paintings by Perugino and Signorelli. Other rooms are dedicated to to the works of the Renaissance outside the city of Florence and house masterpieces by Dürer, Mantegna and Correggio. The halls dedicated to the sixteenth century feature the wonderful works of Michelangelo as the Doni Tondo, as well as paintings by Titian and Tintoretto. The Red Room and the Blue Room expose instead compositions of Flemish painters and sculptures, along with paintings by Andrea del Sarto, Pontormo, Rosso Fiorentino, and Bronzino. The Halls of Caravaggio and of Caravagesques house world famous masterpieces such as the Bacchus and the Medusa, as well as paintings by Guido Reni. The Uffizi Gallery includes finally the Cabinet of Drawings and Prints, which features one of the largest collections in the world and includes drawings of Leonardo and Michelangelo, and the Contini-Bonacossi Collection acquired at the end of the nineties which includes works by Andrea del Castagno, Gian Lorenzo Bernini and Goya, as well as rooms dedicated to temporary exhibitions. Reduced ticket: citizens of Italy and EU plus citizens of Switzerland, Liechtenstein, Island and Norway aged 18 to 25 years. Free admission: on the first Sunday of each month; Firenze Card owners and categories of visitors listed here. Annual PassePartout: unlimited priority admission for 365 days. Annual PassePartout for all museums: unlimited priority admission for 365 days to Uffizi Gallery, Pitti Palace museums and Boboli Gardens. Annual PassePartout family: like above but valid for 2 adults plus an unlimited number of children. Since the 1st of March 2018 the Uffizi ticket also includes free admission to the National Archaeological Museum​​​​ of Florence. NB – The cost of the ticket may vary during special events or thematic exhibitions. Here all the info to make a telephone reservation or to buy online the entrance tickets for the Uffizi Gallery through the official channels. NB – In this way you are sure to pay the lower reservation cost (for the Uffizi Gallery is 4 euro). The only inconvenience is that you are not able to undo the reservation or to change its date and hours. The advantage to use other channels – like GetYourGuide, for example, a website that offers also guided tours with skip the line tickets included – is the possibility to change or to undo the reservation. NB – Operators speak Italian, English and the most widely used languages. You have to indicate your entrance day and time and you will receive a booking code. When you present your booking code to the museum ticket office – at the door #3 (“Reservations”) – you can pay for and receive your admission tickets. NB – For the tickets purchase you need a credit card. After the purchase, you will receive a confirmation email. Print out and bring it to the museum ticket office, where it will be exchanged for an entrance ticket. With your ticket you can now enter the museum – through the door #3 (“Reservations”) – skipping the line.